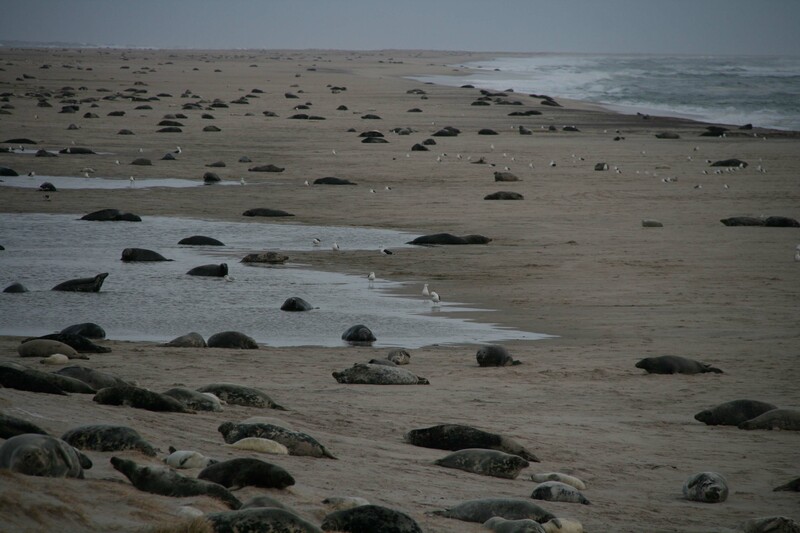 During December and January, Sable's shorelines and dunes get crowded with resident grey seals that come ashore to give birth, feed their pups, and mate. Gulls mill about the seal colony in search of food like placentas from seal births, dead pups, and carcases of seals washed ashore. The Sable landscape is completely changed in the winter. The waves are bigger, the wind is stronger, dunes become sand storms, the lush vegetation dies back and the resident population explodes! Not the human population but the population of native wildlife that migrate to the island. By mid December, this island is crowded with grey seals that come to Sable to give birth, nurse and fatten up their pups, and mate. With thousands of seals on the beaches and dunes, it’s a spectacle to behold … the sights and sounds are reminiscent of a zombie movie with seals crawling every which way, moans, groans, snarling and snapping at your feet as the females protect their pups, the young learn to crawl and the big males compete for mates. They are wonderful, adorable (the pups), powerful, and assertive creatures. Recent estimates showed that more than 65,000 seal pups are born here annually making Sable the largest grey seal colony in the world – learn more about research that’s been conducted here by the Department of Fisheries and Oceans (DFO) for several decades now. Along with the seals come the gulls that “flock” to the island to feed. The winter medley of Sable gulls is much different from the summer breeding population. In the summer, Herring Gulls outnumber Great Black-backed Gulls by about 4 to 1. In winter, Great Black-backed Gulls are the dominant species probably numbering in the thousands (2000-5000 would probably be my best guess). For every 200 Black-backs there’s maybe 20 Iceland Gulls, 1 Glaucous Gull, the occasional Herring Gull, and other rarities like the Lesser Black-backed Gull. Why so many gulls on this remote sandbar? They come here to feed and fatten up for the winter. In winter, food resources are often scarce for wildlife, but Sable offers a smorgasbord for gulls. The large seal population presents rich and nutritious meals of protein and fat from placentas left over from births, dead pups that are weaned too young, and seal carcases that are washed ashore after being killed by sharks. I had the great pleasure to spend New Years on Sable where I worked for 2 weeks in December/January helping colleagues from DFO with their long-term seal research program. We were conducting seal population census, monitoring pup production, and and recovering tags from seals involved with the Ocean Tracking Network project. During our “spare” time, three of us that were staying at the East Light Field Camp (Sarah, Damian and myself) were busy trying to catch gulls. Since they were already cued in on dead seals, we took advantage to set leg-noose carpets around seal carcasses. While feasting on the open carcases their legs would get caught in the nooses and we were on standby right as this happened. Winter gull catching is not for the faint of heart… frozen fingers, blowing sand, blood and guts (from the seal carcases and also from the gulls regurgitating on us once they were captured), and aggressive seals. During our last capture session a snow storm set in just as we were finishing up with our last bird. 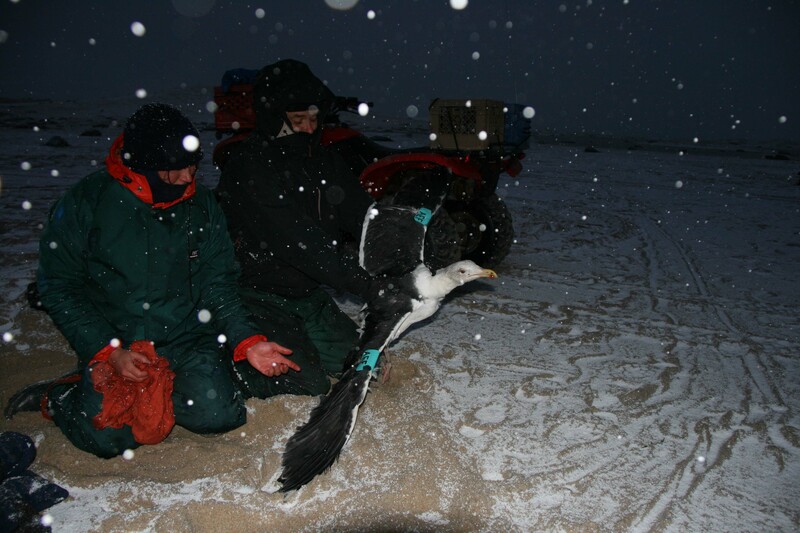 Just after sunset, as a snow storm sets in, Sarah and Damian release an adult Great Black-backed Gull after tagging it during our last day on Sable Island. We measured, weighted and tagged 12 Great Black-backed Gulls this winter with turquoise wing-tags and green leg bands. With some vigilance this summer, hopefully we’ll discover where these gulls came from (Maine? New Brunswick? Newfoundland?) to forage on this rich bounty of Sable seal flesh! P.S. Special thanks to Simon who cut out all the tags for me back in Halifax! 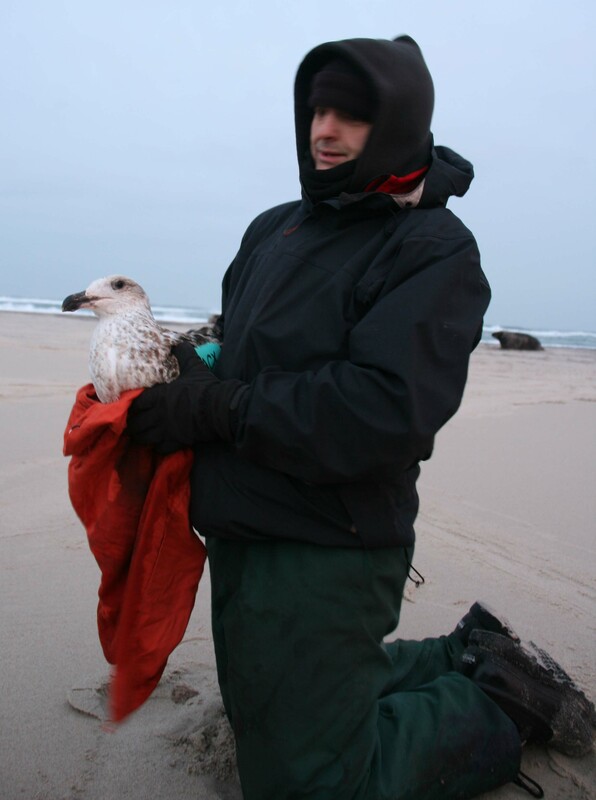 Damian holds a young Great Black-backed Gull ready for release after tagging. Maybe Damian is contemplating a career change now from seal biologist and photographer (lidgardphotography.com) to ornithologist. East Light field camp where we stayed for 2.5 weeks in December and January. 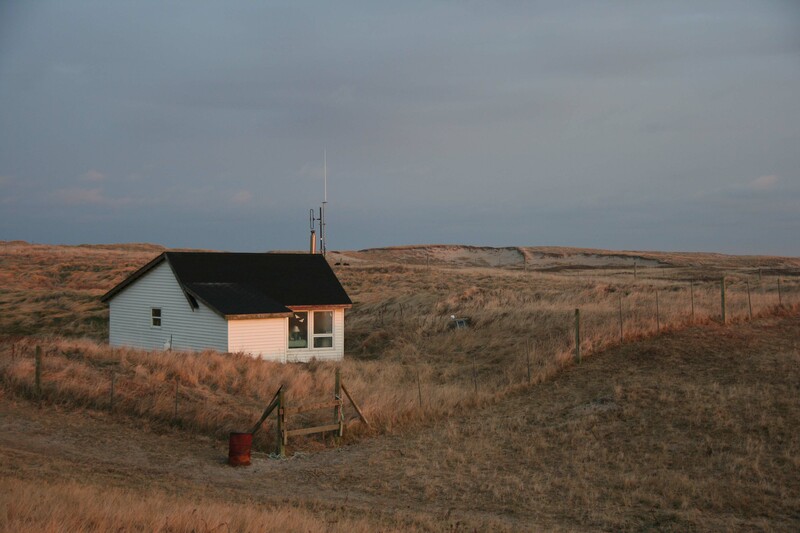 This field camp is run by the Department of Fisheries and Oceans at the Bedford Institute of Oceanography. 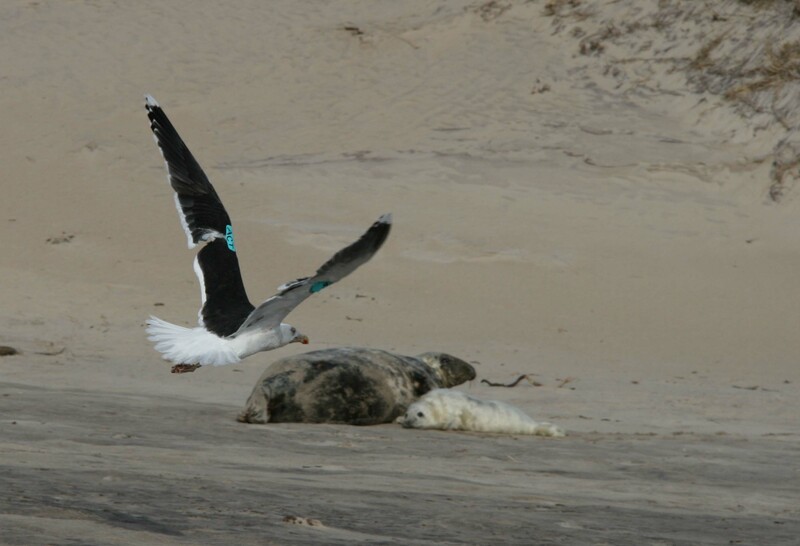 Blue/Turquoise wing-tagged adult Great Black-backed Gull flies by mother grey seal with her pup. I spotted a juvenile Great Black -backed gull with a blue/green tag “ACU” or “RCU” this morning, 26Jan2012 with a flock of Herring and Ring-bills at Sapowet beach in Tiverton, Rhode Island. Could it be one of yours? Wow! ACU was banded/tagged just a couple weeks ago on Sable Island (Jan 12th)! If you spotted a wing-tag with those letters then it is certainly one that we tagged (there is no RCU tag that we have deployed yet). A long way to go in a short period of time. Nice find!